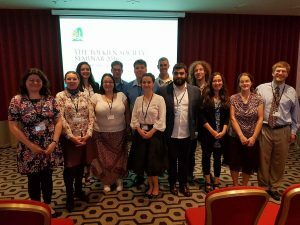 and the International Medieval Congress at Leeds (4th-7th July), one of the most prestigious conferences on medieval studies worldwide, for which I organized Tolkien sessions for the second year running in an effort to establish an annual gathering of Tolkien academics on this side of the pond (following the long-standing example of “Tolkien at Kalamazoo“). 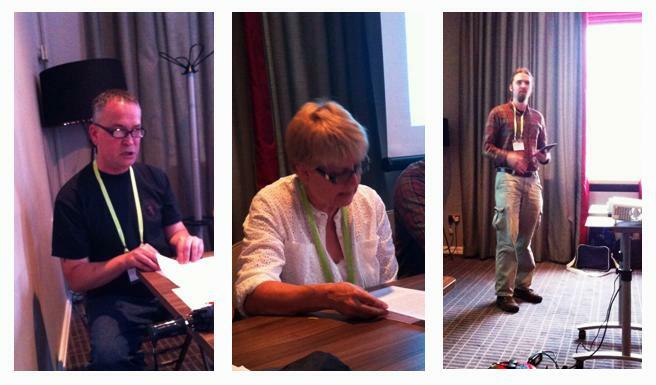 Both events were very successful and included speakers from the UK, Europe, and North America. Among the other papers, I was particularly impressed with Irina Metzler‘s talk on “Tolkien and disability: the narrative function of disabled characters in Middle-earth” (her tripartite exploration of case studies as a way to survey Tolkien’s use of disability in his extended legendarium worked really well). Andrew Higgins‘s paper ‘”Gifts in harmony?”: a philological exploration of Tolkien’s invented words for “life” and “death”‘ was an excellent demonstration of how examining Tolkien’s invented languages can illuminate his mythology (the essence of Andy’s PhD thesis). Other papers I really liked (even if I didn’t always agree with all points and arguments) were given by Tania Azevedo, Anna Milon and Adam B. Shaeffer. You can see the entire programme here. Overall, an excellent day, full of insightful discussion and debate. Thank you to Shaun Gunner and Daniel Helen for excellent organizing! 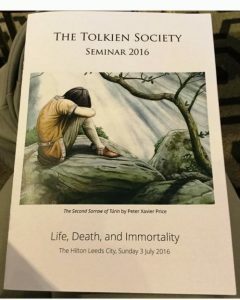 It was a pleasure to be the organizer of the Tolkien sessions at Leeds – onwards and upwards! The session addressed the complexities of Tolkien’s modern Middle Ages. Andrew Higgins explored Tolkien’s appropriation of Old Norse and Anglo-Saxon perceptions of the Finns in his legendarium. Sara Brown revisited Tolkien’s The Lord of the Rings via the practice, philosophy, and symbolism of alchemy. 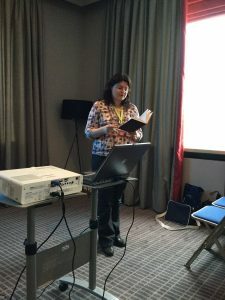 Aurélie Brémont examined parallels between Tolkien’s and T.H. White’s medievalisms. The session was moderated by Chris Vaccaro (University of Vermont). This round table discussion will focused on works by J. R. R. Tolkien published during the last 12 months. Participants commented on The Story of Kullervo, edited by Verlyn Flieger, a creative retelling of a tragic episode from the Finnish Kalevala; and A Secret Vice, edited by Dimitra Fimi and Andrew Higgins, an extended edition of Tolkien’s essay on invented languages together with new material on philology, contemporary language theories, and language as art. Participants: Brad Eden (Valparaiso University), Kristine Larsen (Central Connecticut State University), and Nelson Goering (University of Oxford). All speakers and other academics and students interested attended a “business meeting” at Leeds to discuss next year’s session proposals. I am hoping to circulate details soon. If you are interested and want to be on the mailing list, please let me know. Thank you for all your hard work putting together the two sessions at Leeds. Here’s hoping for even more next year!